Vobis pilot scale molecular distillation systems that we design and manufacture for clients are also called short path evaporator systems and are agitated film evaporation systems supplied which can be implemented with various rolling and wiper systems and that have an internal condenser which is inside of the evaporator and whose condensing surfaces are very close to the continually renewed film distributed on the heat transfer surface of the evaporator. That the internal condensor is physically so close to the heat transfer surface area of the SPD minimizes pressure drop by reducing the intermolecular interactions of the vapor molecules and allows operation at extremely high vacuum levels, as low as 0.001 mbar, for implementation to protect very heat sensitive natural and synthetic products. The high vacuum level lowers the effective boiling point for very gentle evaporation of volatile components. This is applied to a wide variety of natural as well as synthetic products where heat sensitivity of the material dictates operating below specific temperature limits. Like a wiped film evaporator, molecular distillation or a molecular still (also known as short path evaporation or SPD) operates with a plug flow throughput of feed material (first in/first out) and a very short residence time while operating under a vacuum. The higher vacuum possible in a molecular still down to micron levels of vacuum compared with those possible in a wiped film, lowers the boiling point for the separation. As well. the high surface renewal through wiping the film across the inner wall of the short path evaporator system, makes certain that a heat sensitive and viscous feed material is treated very gently and minimizes the thermal stress. Our pilot molecular distillation systems (also refered to as short path evaporator systems) are constructed in a variety of process wetted materials including stainless steels, titanium, or duplex steels according to the application requirements and can come complete with feed and harvest vessels, vacuum system, all piping (jacketed, heat traced as necessary), valves, and pumps mounted within modular skid frames, and provided with a PLC control system similar to our production systems for accurate control and to allow our clients to collect scaleable data for use in the design of larger systems. The feed material is distributed on the inside wall to create a thin film on the heated evaporator body and is wiped down the wall to maintain turbulence and high heat and mass transfer with one of our rotor configurations. Just inside of and very close to the heated wall that has a thin film of feed material is the condenser. The residence time of the heated material flowing downward in a plug flow manner is only seconds before the unevaporated materials are discharged from the short path evaporator, thus protecting the heat sensitive products of the separation. 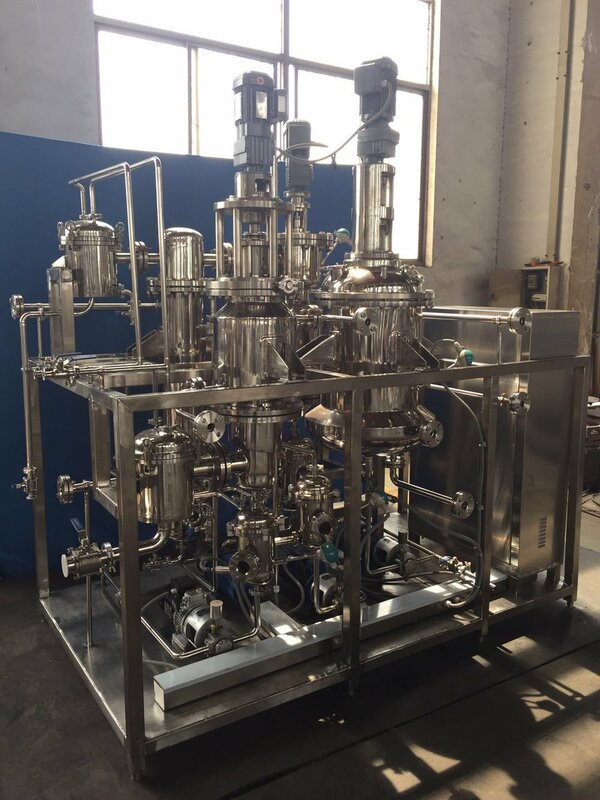 For production scale molecular distillation systems please visit our Vobis, LLC production molecular distillation system website.